Did you know? So far, more than 20 million people have travelled abroad from India in 2017. A good portion of this number comprises of business travellers. If you are a person who frequently flies abroad for business purposes, then pay attention. RBI has prescribed few limits on foreign exchange when going abroad from India for business travel. 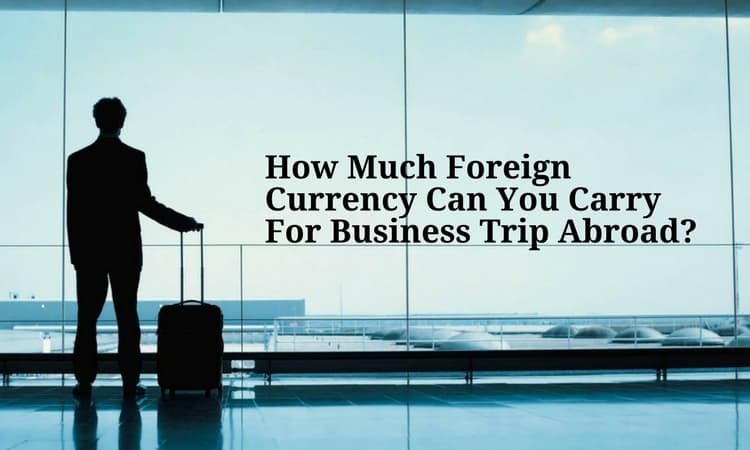 In this blog post, we are going to discuss how much foreign currency you can carry from India for business travel. Also, how much Indian currency you can take outside India. Respectively the currency limits when coming back inside the country. How much foreign exchange is available for a business trip abroad from India? As per RBI guidelines, you can take up to US $2,50,000 per trip while travelling abroad from India for business purposes. RBI updated this limit on July 2015. Before that, it was US $25,000 per trip. If you require more than US $2,50,000, then you need to request prior permission from the Reserve Bank of India. If you are wondering how much Indian rupees can be carried while travelling abroad, it is Rs 5000 per business trip. Please Note : The total amount of foreign currency that can be taken abroad from India for business purpose is US $2,50,000 per financial year. You can take this entire amount either in a single trip or by breaking it down in multiple trips abroad but the total limit per financial year stands at US $2,50,000. What constitutes a business trip? Travelling abroad as a representative of your company for matters of business, attending an international conference, seminar, specialised training, study tour, training etc are treated as business visits. Even visit abroad for medical treatment or medical check-up fall within this category. What is the best way to carry foreign exchange abroad from India for a business trip? There is a very efficient and simple strategy to follow for carrying money abroad. This 5 point strategy is applicable for both leisure and business travellers. Buy a multicurrency forex travel card. You’ll be able to load the currencies of around 16 countries in one single card. This would be immensely useful if you are travelling to multiple countries. Also, load 70% of your “Total Expense” in forex card. Majority of your spendings abroad will be done by swiping your card in PoS machines. Carry 30% of “Total Expense” as local currency of the country you are travelling in. This is to help you to purchase items and services quickly in business places where they don’t accept cards. Your Credit and Debit cards have many charges associated with them when using abroad. These charges can be Dynamic Currency Conversion (DCC) fee, interbank fees, and unfair exchange rates. So use them only as a backup option. They are hardly in use now and many business institutions, including some banks, don’t accept them as a means of payment. From where can you buy foreign currency for travel abroad? Foreign Currency or ‘Travel Money’ can be procured from any Authorised Dealer, appointed by Reserve Bank of India – such as an AD Category-I (Bank) and AD Category II and Full-Fledged Money Changers (FFMCs). These Authorised Dealers / Money Changers are licensed to release foreign exchange up to US$2,50,000 for a business trip to any country other than Nepal and Bhutan. The total eligible Foreign Exchange limit per traveller is US$ 2,50,000 or its equivalent in any other currency. Given below is the table listing how much cash you can carry from India to abroad per trip abroad as foreign currency and forex card. You can also purchase forex online from forex aggregators like ExTravelMoney.com. ExTravelMoney is an online forex portal where services offered by banks and moneychangers can be booked online through the website. The customer can compare the exchange rates offered by forex stores in their area, compare the total cost of forex and make an informed buying choice. The forex can then be booked online. An ID Proof of authorised official signing the request letter. How much foreign exchange can be bought in while coming into India? A resident Indian coming back to India from a trip abroad can bring any amount of foreign exchange. The only rule to follow is that this money is to be declared to the Customs Authorities at the Airport in the Currency Declaration Form (CDF), upon arrival in India. Regarding Indian currency, not more than Rs 5000 can be bought into the country when coming back from a trip abroad. What to do with leftover foreign currency after coming back from a trip abroad? On return from a foreign trip, travellers/officials are required to surrender unspent foreign exchange. This could be held in the form of currency notes and travel cards. The money is to be surrendered within 90 days of return to the company. However, they are free to retain foreign exchange up to USD 2,000, in the form of foreign currency notes or Travel Cards for future use. Otherwise, it can be credited to the company’s current accounts. Hey readers, hope this post could enlighten you on forex limits of business traveller’s from India. Click on the share button below if you found the article informative. For any doubts and clarifications, reach out to us through the comments below.